Abstract: John Hancock was a congressman, judge, and lawyer who made his home in Austin, Texas. In 1851 Hancock was elected district judge of the Second Judicial District. In 1860 he was elected to the Texas legislature as a Unionist Democrat. He was expelled from the legislature in March 1861 when he declined to take the oath of allegiance to the Confederate States. He remained a conscientious objector throughout the Civil War and continued working as a lawyer. He left Austin for Mexico in 1864 to avoid conscription in the Confederate army. Several months later he moved to Union-held New Orleans, Louisiana, and spent his time helping “Texas Refugees”—those who had fled Texas due to Union sympathies or who had deserted from the Confederate army. Hancock kept this personal diary, dating November 1864-June 1865, during the time he was in New Orleans. He recounts daily life, news of the war, the struggle to obtain and sell cotton and livestock, meetings with prominent Texans and the Louisiana legislature, and his sadness at being separated from his wife and child. A description of the original records referenced in this finding aid, including those not digitized, is available at https://legacy.lib.utexas.edu/taro/tslac/12007/tsl-12007.html. The collection consists of one diary with entries in chronological order. John Hancock, congressman, judge, and lawyer, son of John Allen Hancock, was born near Bellefonte, Alabama, on October 24, 1824. After attending the University of East Tennessee at Knoxville, he began to study law in Winchester, Tennessee. He was admitted to the Alabama bar in 1846, then moved to Austin, Texas, in January 1847 and began a successful law practice. In 1851 he was elected district judge of the Second Judicial District for a term of six years, but he resigned at the end of four years to resume his law practice in Austin and engage in planting and stock raising. Hancock married Susan E. Richardson in November 1855. Hancock was elected to the Texas legislature in 1860 as a Unionist Democrat determined to keep Texas in the Union. He was expelled from the legislature in March 1861 when he declined to take the oath of allegiance to the Confederate States. He remained a conscientious objector throughout the Civil War and continued working as a lawyer, practicing only in Texas courts and refusing to try cases in Confederate courts. After the Confederate draft was enacted, officials began looking for him to press him into army service, so on April 20, 1864, he left his family in Austin to head for Mexico, possibly to Matamoros or Monterey. Several months later he moved to Union-held New Orleans, living in a hotel and doing his best to help “Texas Refugees”—those who had fled Texas due to Union sympathies and, later, those who had deserted the Confederate army. Typical Texas refugees were not judges or former politicians but usually laborers, farmers, or artisans who arrived in New Orleans destitute and hungry, often with only the clothes they were wearing. Hancock provided them with both monetary assistance and met with members of the military and the Louisiana legislature on their behalf. He also worked to recruit these refugees to fight for the Union, a venture that was only mildly successful. Near the end of the Civil War, Texas Governor Pendleton Murrah and General John Bankhead Magruder, commander of the district of Texas, appointed Confederates William Ballinger and Ashbel Smith special commissioners to secure terms of peace for the state. The commissioners arrived in New Orleans on May 29, 1865, and met with Hancock and several other prominent Texans to begin this task. Hancock reunited with his family in Austin at the close of the Civil War. He later went on to be elected as a Representative to the 42nd U.S. Congress (1871-1877) and again to the 48th U.S. Congress (1883-1885). He died on July 19, 1893, in Austin, Texas. John Hancock was a Unionist congressman, judge, and lawyer in Austin, Texas, who moved to Mexico in 1864, then New Orleans, Louisiana to escape Confederate army conscription. 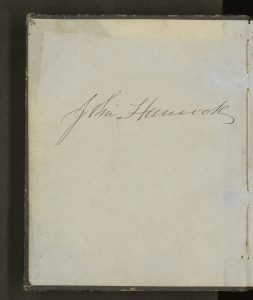 The John Hancock diary consists of one bound journal of 210 pages, dating November 28, 1864, to June 30, 1865. Hancock kept this diary during the time he was living in New Orleans during the Civil War. He writes about the trials and tribulations of his daily life and his efforts to help other “Texas Refugees” who had less resources and influence than himself. This diary includes news of the war, the struggle to obtain and sell cotton and livestock, his meetings with Louisiana Lieutenant Governor (later Governor) James Wells and other members of the Louisiana legislature, and his sadness at being separated from his wife and child. The diary also documents meetings with other prominent Texas refugees, including A.J. Hamilton and George Denison; and later meetings with William Ballinger and Ashbel Smith, Confederates appointed by the Texas government to secure terms of peace for Texas. Diary pages are numbered inconsistently by the author; entry date is the preferred citation method. Texas Governor Andrew Jackson Hamilton records, 1865-1866, 3.5 cubic ft.
Texas Governor Pendleton Murrah Records, 1863-1865, 2.25 cubic ft.
Texas Governor Sam Houston records, 1824-1862, bulk 1859-1861, 2.5 cubic ft.
Texas. Adjutant General’s Civil War Records, 1855, 1860-1866, undated, bulk 1861-1865, 17.96 cubic ft.
Texas. Supreme Court records, 1840-1980, 6,396.81 cubic ft.
Ashbel Smith, Papers, 1823-1926, 10 ft. 9 in. Ballinger (William Pitt) Papers, 1815-1909, 17 ft., 5 in. This diary was purchased on February 27, 1931, by the Texas Library and Historical Commission, Division of Archives and History, from E.L. Shettles, bookdealer, Austin, TX. An accession number was assigned for control purposes on August 1, 2018.